An Australian “crow”, up on a wire. I’m a bit late (as usual) it’s already the 30th down here. I haven’t been to India, or any other colourful exotic culture, so what else? 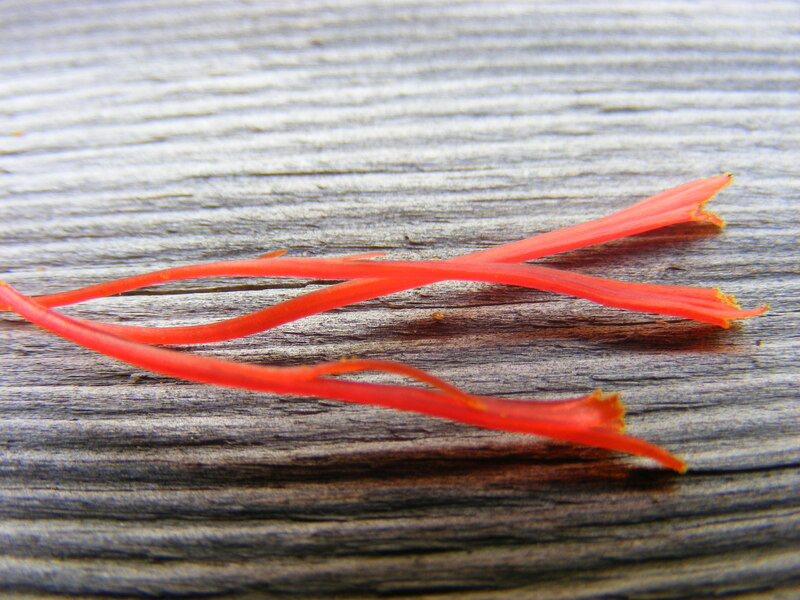 I thought of music, festivals – plenty of colour and movement there – . 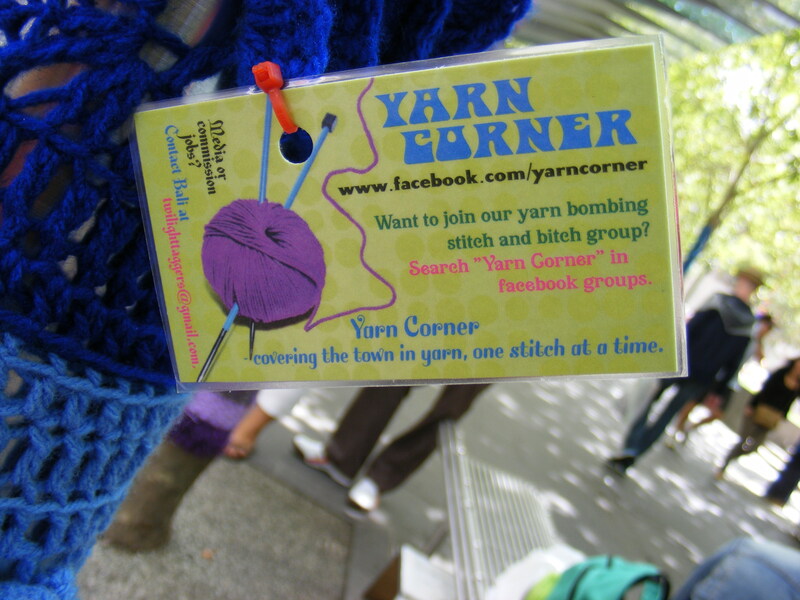 and then I thought, Yarnbombing! That’s become a culture all of it’s own. 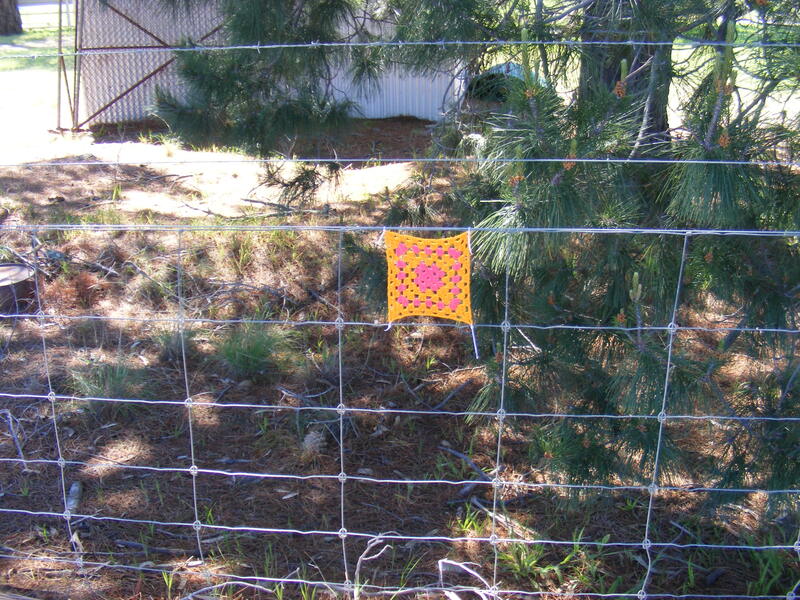 From humble beginnings in Texas (so the story goes) yarnbombing has spread around the globe. This one is the work of a church social group in Brunswick. 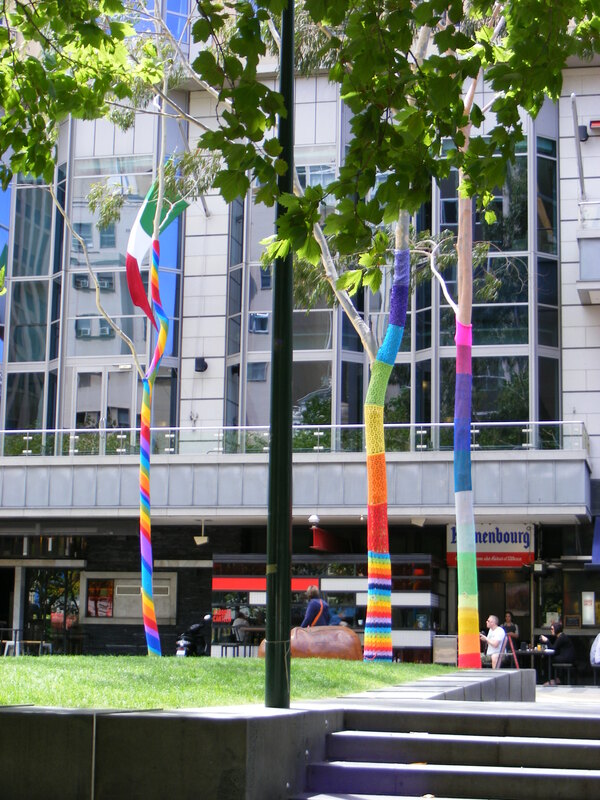 The first one was in Melbourne’s City Square, and had government sponsorship. Old style graffiti is less welcome, sadly, although it brightens dull corners equally well. It’s a lot harder to remove, so I guess that’s got a lot to do with it’s unpopularity with some sectors of the community. 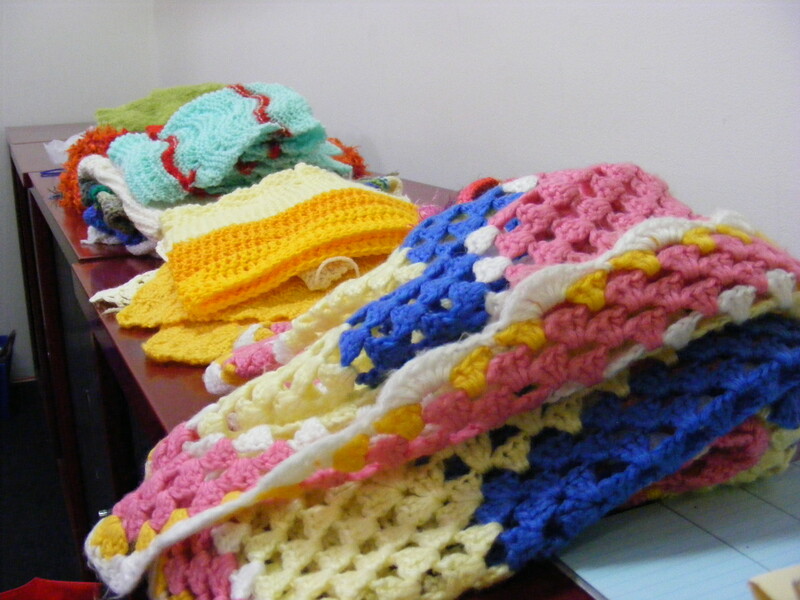 Ararat’s Regional Art Gallery is justly famous for it’s focus on textile and fibre art. 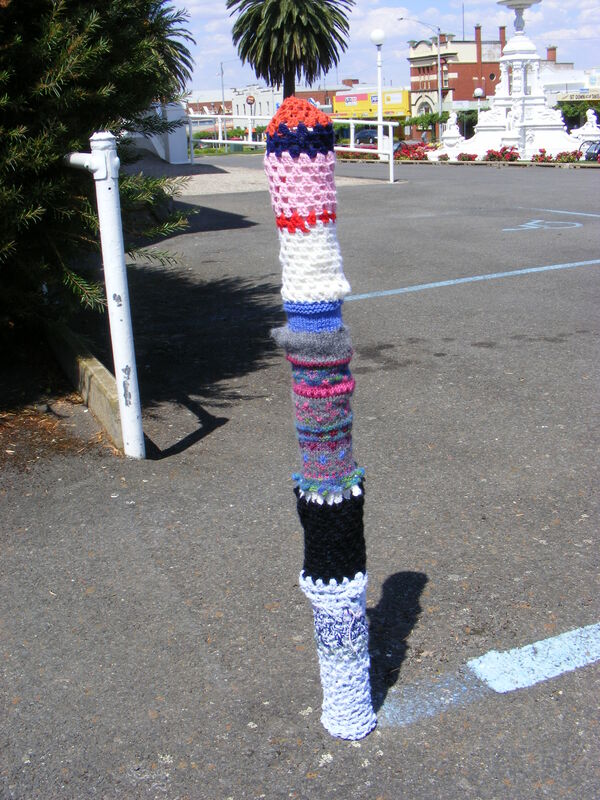 What better way to celebrate it than a yarnbomb? 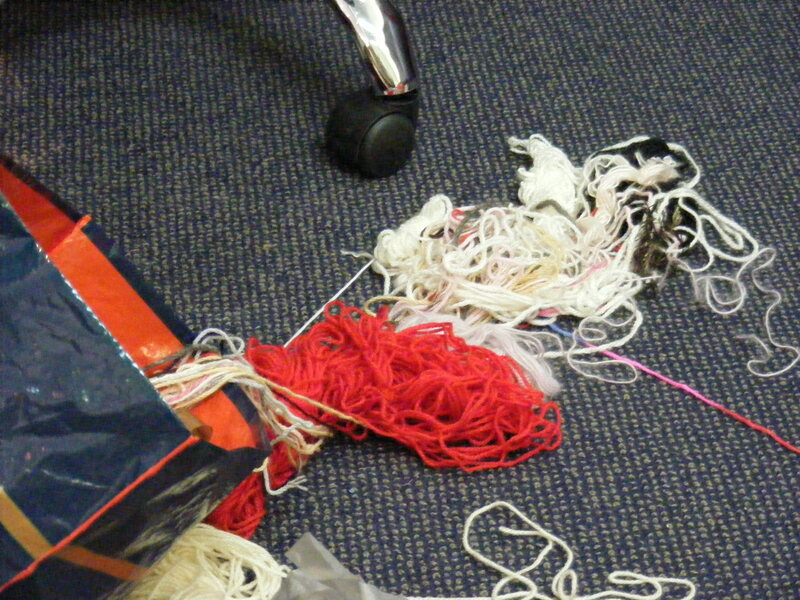 Ever since I said “Let’s yarnbomb the gallery” to our Director, and he said “Good idea. 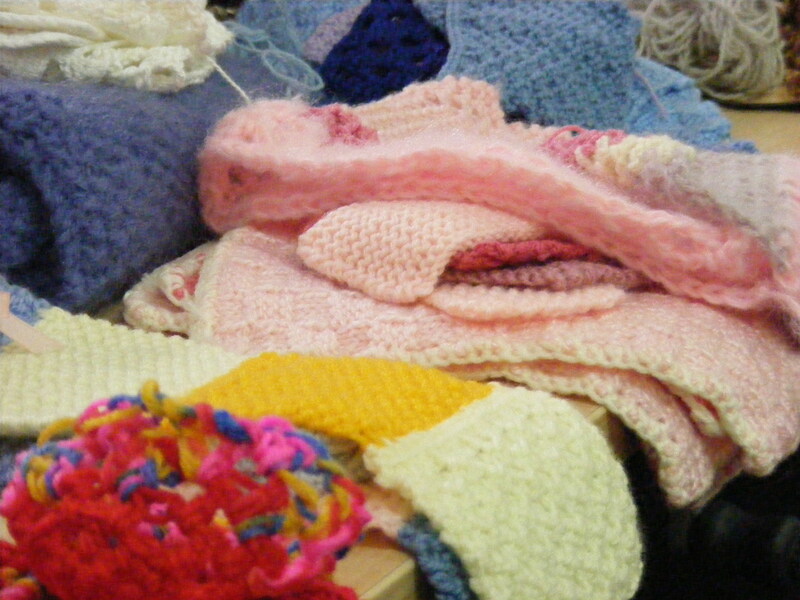 You organise it”(or words to that effect), I and Deb and a few others have been working away at knitting and crocheting pieces with which to embellish the surroundings of the building. 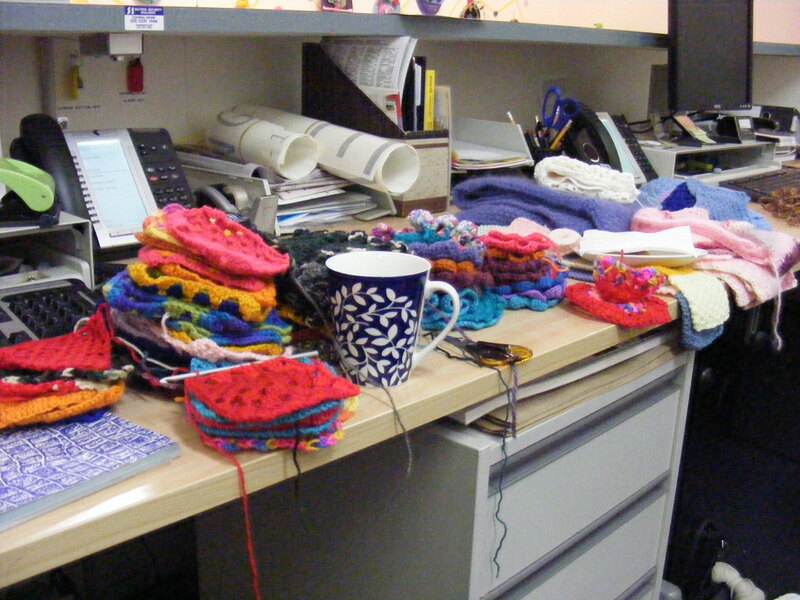 The Gallery is 45 this May, so to celebrate that cultural achievement, our yarnbomb will be installed on May 13. 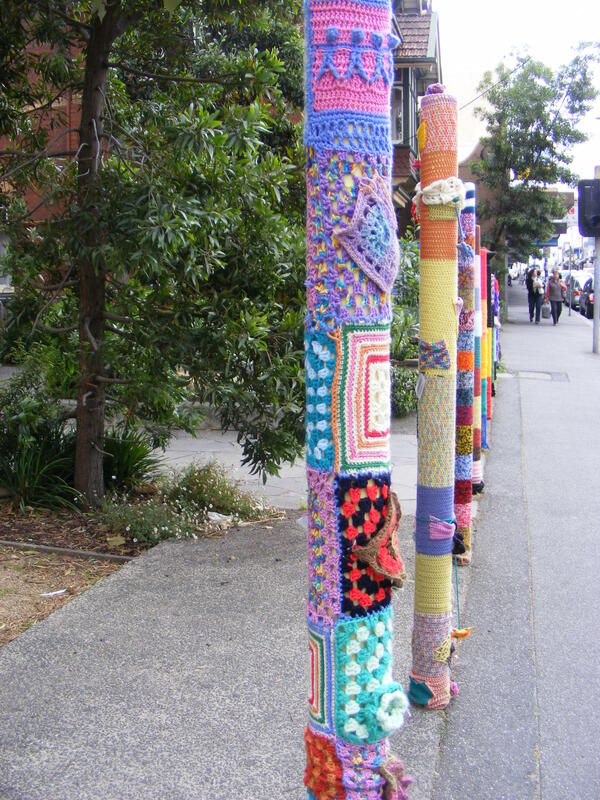 It won’t be our last foray into the culture of yarnbombing! Challenge of the week – ‘Up”. So I chose a few, some from The Trip Of A Lifetime, some from nearer home. Some from up, looking down, some from down, looking up. One of these pictures is not like the others. Can you tell which it is? Which land it came from? 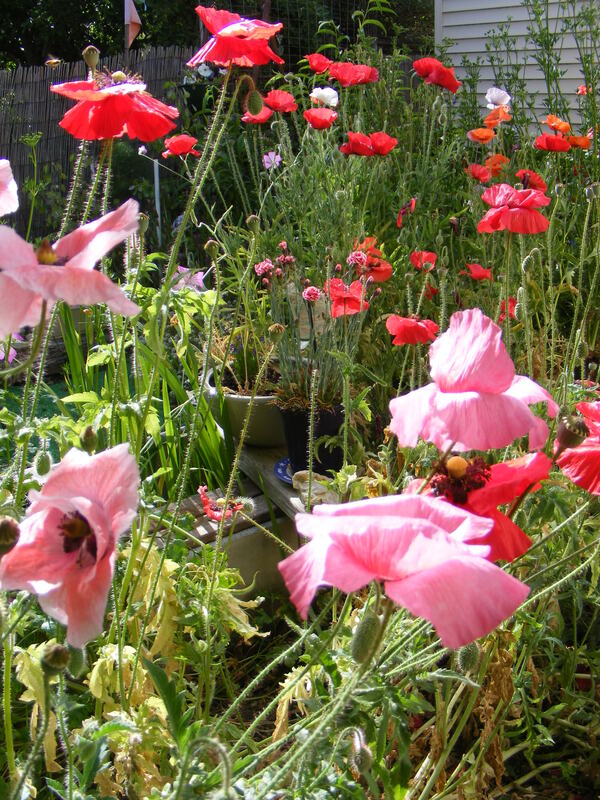 I wrote this 10 or more years ago, after my son’s young friend ( I’d guess he was about 8 ), greeted me on his arrival at our door with the words “Happy Anzac Day!”, as though it was Christmas or New Year. The oddity of the greeting set me thinking, and gave rise to this poem. “Somebody should tell us right from the start of our lives that we are dying. Then we might live life to the limit every minute of every day. “Live your life with thankfulness in your heart, and always be filled with positive expectation, knowing that everything that happens in your life can be used for your benefit. Know that you are guided along a path of never ending growth and learning. Acknowledge your creator and be a force for good. Share your riches, share your passion and share your enthusiasm. you run the risk of being changed yourself. One of these quotes refers to “your creator”, and I’m not sure what he meant by that. You can make of it what you will -it’s a rather outmoded term, and maybe it’s an old quote, but generally I think it holds useful ideas. The Carl Rogers quote is of it’s time, and therefore couched in blatantly sexist language. However, if you are willing to enter her private world etc, you might see it her way, and you risk being changed, just the same. Here in ‘the land down under’ it’s the evening of April 17. My Dad’s 82nd birthday, thanks to quite a lot of medical intervention over the past three weeks. Today he is tired, but on the mend, and back home with Mum and his beloved cats. In the far away Pacific North West, its around 2.30am 0f April 17 . Twenty-two years ago on this day, Nirvana played a show at the OK Hotel in Seattle. I think it was for petrol/gas money for the trip to California to record their second album. And it was the first time that Smells Like Teen Spirit was played in public. 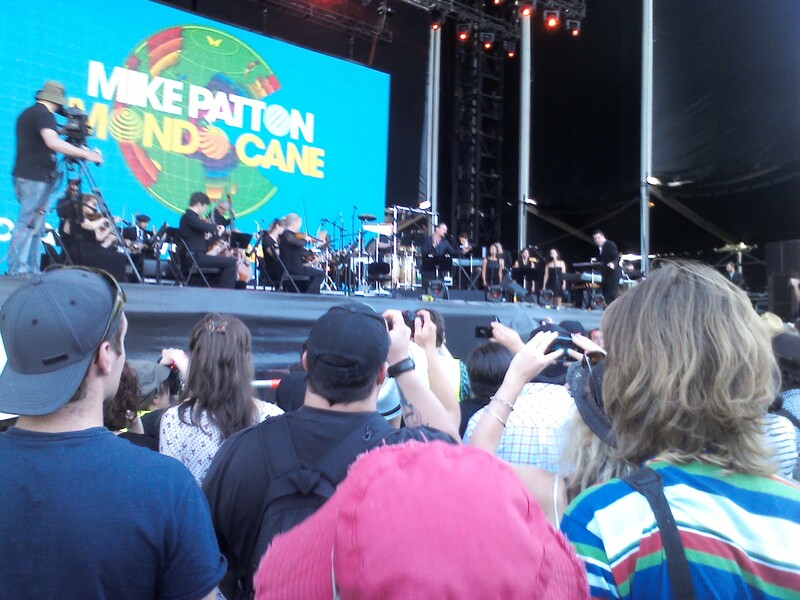 The crowd seemed to like it. 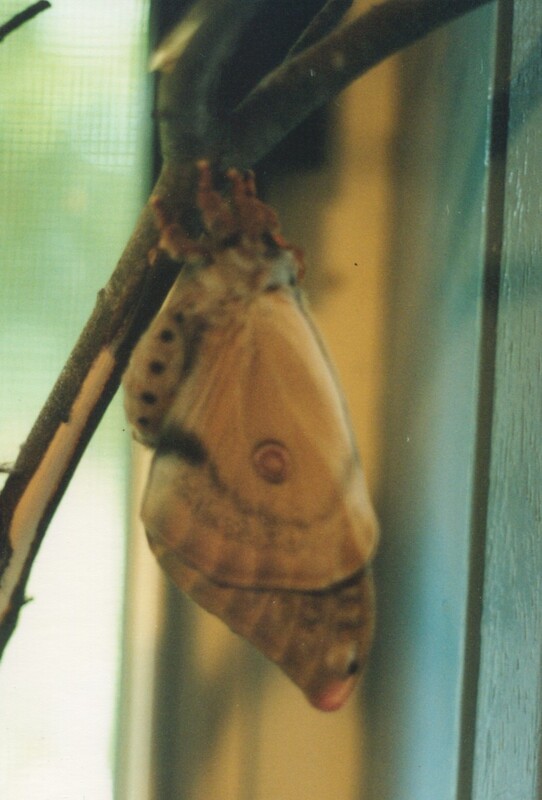 I thought about going outside and taking photos of the changing leaves, or posting the latest pic of my grandchild-to-be (except that a medical technician took it, not me), and then I remembered this series of photos of a Helena moth, newly emerged from her cocoon, in which she had undergone amazing change. 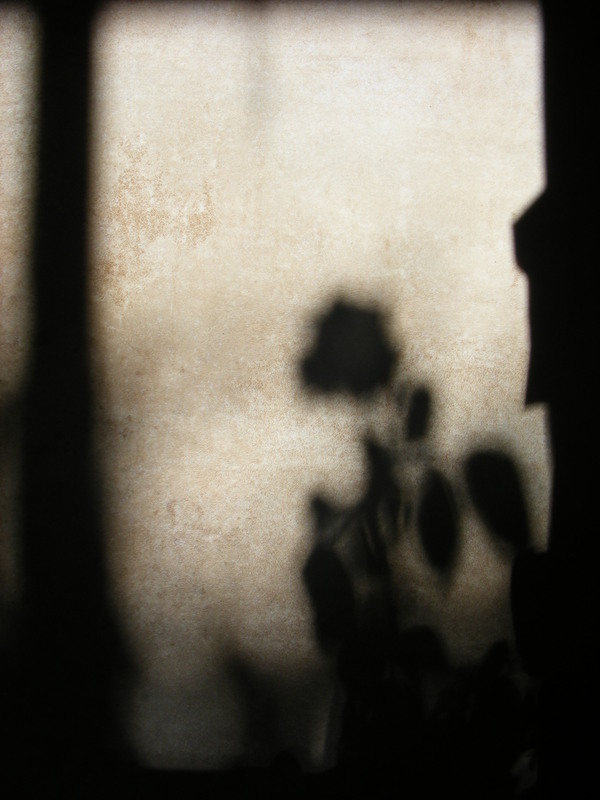 They were taken years ago, with a vintage SLR film camera, which sadly doesn’t (reliably) work any more. Someone found a cocoon, and brought it home, where it sat on a window sill for a long time. 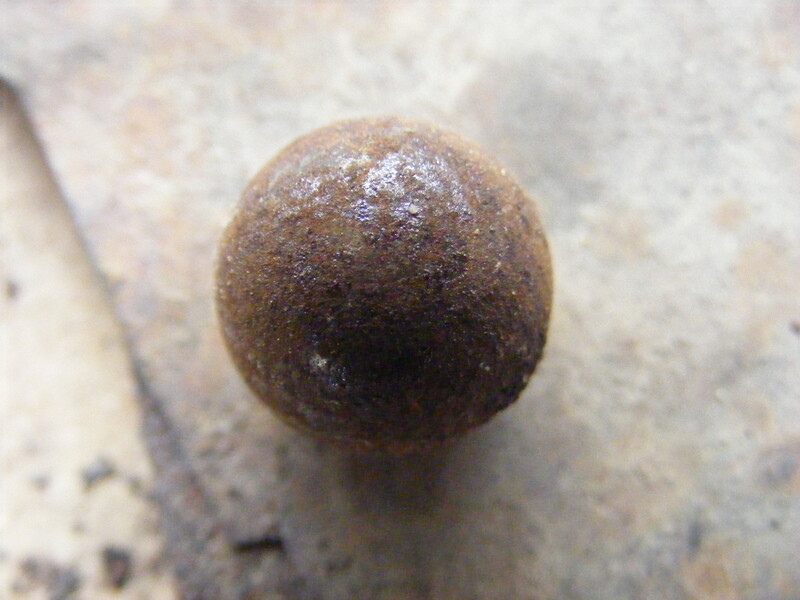 This isn’t the cocoon in question, but it’s the same kind. When Lucie found this one, it had already been vacated. 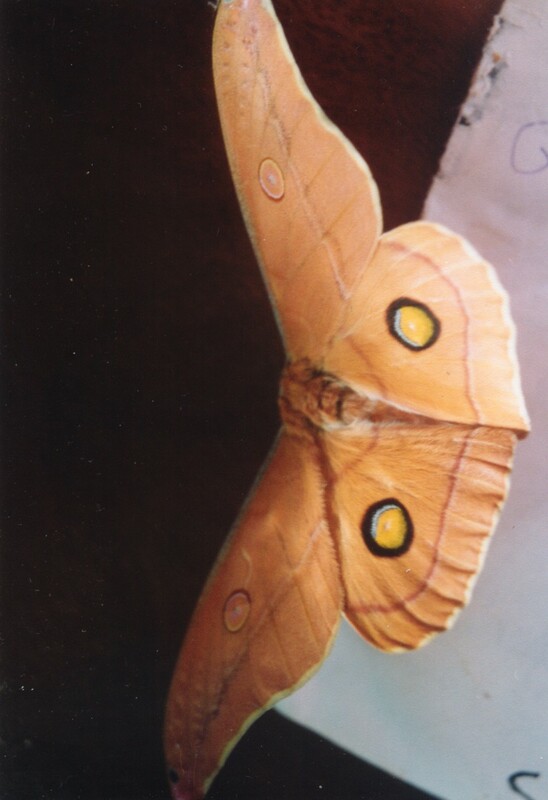 The one belonging to the moth in these pictures, however, had a sleeping beauty inside. One day, we were puzzled by a strange scratching that went on and on. Eventually, we realised it was coming from the cocoon on the windowsill. Sleeping beauty had awakened, and was scratching her way out. It is a long process – hours- but finally the moth emerges, utterly changed from when she wove her little shelter around herself. 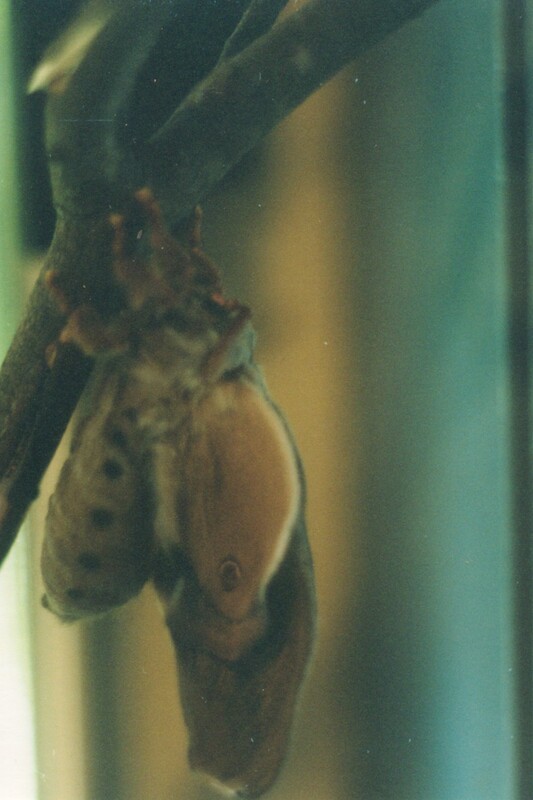 Back then, maybe years before, she was a fat green caterpillar; now, she’s a brown, furry moth with crumpled wings. Her impulse after she emerges is to climb. And then she sits quietly while her wings pump up. Once more, the process takes a surprisingly long time. She didn’t choose a spot,or time of day with ideal lighting, so the focus is as soft as her plump brown body. At last, her wings are fully extended. They need to dry, and then she will start to flutter them. She will rest for a while, and at dusk, fly off in search of a mate, who will find her by his marvelous sense of smell, and her pheromones. The adult, with wings extended is about 10 cm (4″) across. 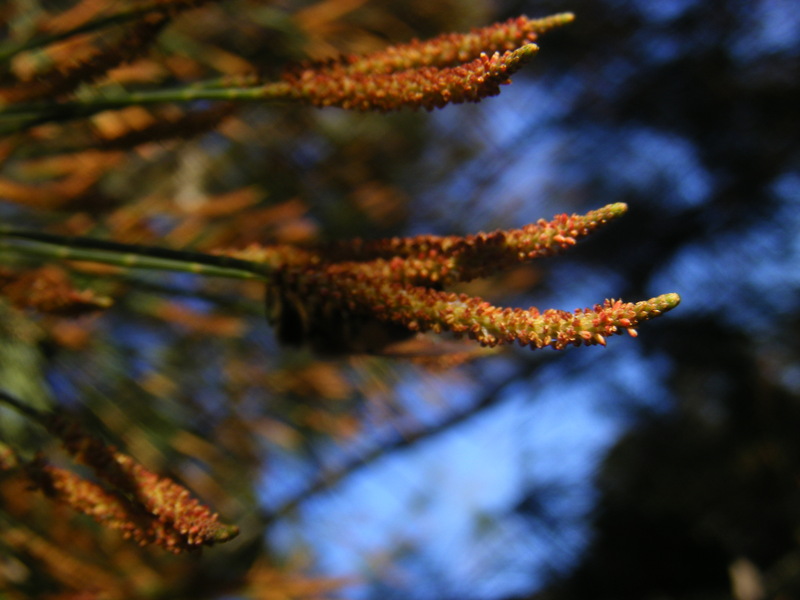 I haven’t seen a caterpillar for years, although that’s not surprising, since they feed high in trees. 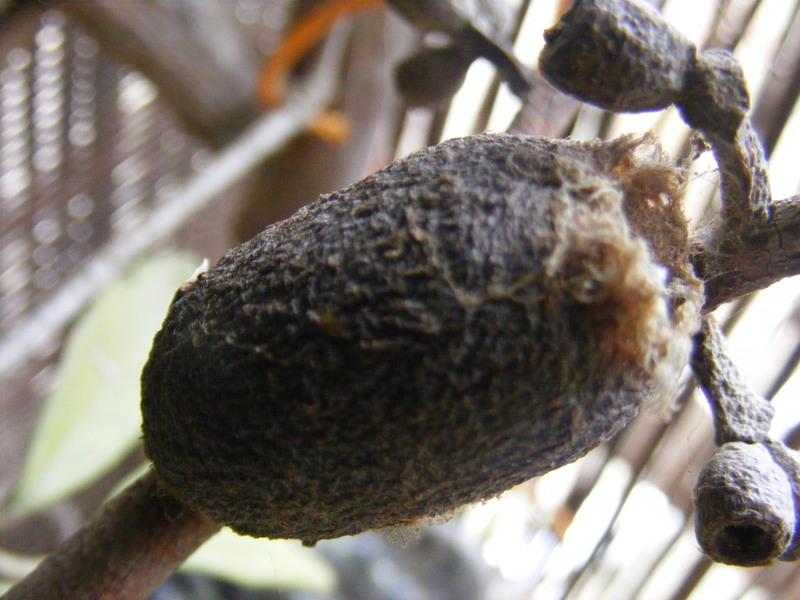 We find cocoons occasionally, and Alex saw an adult moth in Ararat a couple of years ago. 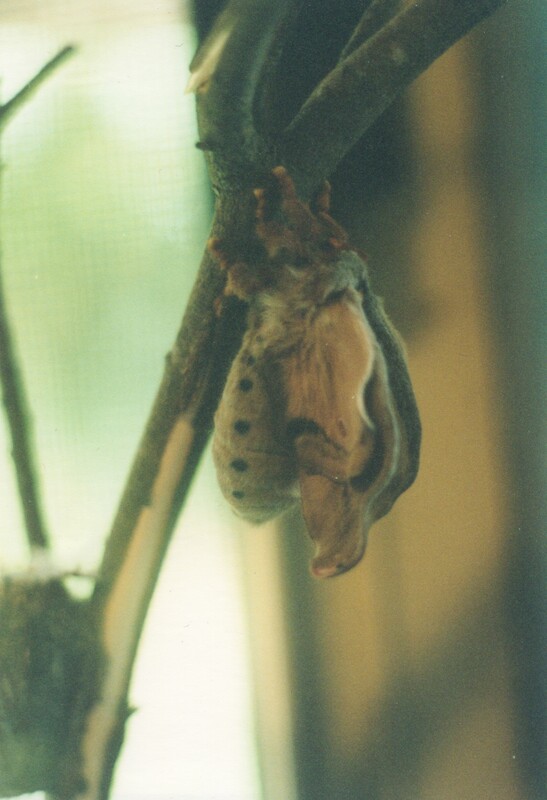 In the 70’s, my family raised some from caterpillars (in the kitchen – Mum wasn’t a trad housewife), and we witnessed all the changes they made from caterpillar, to cocoon, to moth. I remember that one pupated on the kickboard of a cupboard, and that my sister, who would have been about 7, ‘helped’ one out of its cocoon, which did it no good at all; they need to claw their own way out. So we put it back in, the other way around, and I held it in my hand for hours (whilst studying for exams), until it finally emerged, a healthy Helena.